Missing from the unit is any kind of external gain control. If you open the unit which requires removing four screws front and back, and the volume control knob and shaft bolt, you find a jumper for three setting. I started my testing with the middle setting but seeing how there was not sufficient gain, I moved it over to the highest. I call the former "middle" and the latter "high" gain. I forget what the third low setting was but I think it was negative gain (?). Anyone buying an expensive amplifier like this would have multiple headphones with different sensitivities and impedances and having an external gain control would be a necessity. There is a version with XLR inputs but that costs even more money. In desktop products, once you go north of $300, I think XLR connections should be mandatory. There is built-in power supply which is nice. When testing though, I found large amounts of mains 60 Hz leakage. It easily dwarfed the distortion products of the unit. I read the documentation and it said there is a jumper to make the ground floating. I changed the jumper so that it was grounded and that bought me a few more dBs of SINAD. If we had balanced outputs, the rest would have been taken care of also. Back to the jumper, I guess it is nice to have the option of making the outputs floating in case one gets into having ground loops/hum/buzz. I may do a teardown later but for now, the insides look very nice -- much better than the outside! The design is an op-amp driving discrete output stage with pretty high voltages (+- 25 volt?). That can give the unit very high levels of output with high impedance headphones. I am pleased to see what looks to be proper regulatory marking which I consider very important when the power supply is internal as is the case here. We start in the same class as our top performing DACs but then distortion starts to rise. The output is a lot higher though at this 300 ohm load. There is no clipping so if the input is raised even more, you get more power (seems like the input stage is designed for the XLR input). As it is, we have a lot more power than single ended output of the Massdrop THX AAA 789. Assuming your DAC has good output levels, you should not have any problems with high impedance headphones. We are not doing as well here. Distortion rises quickly above 300 millivolts and we have hard clipping due to insufficient amount of current at the limit. I initially ran this in the medium gain setting and noise level dropped to very close to Massdrop THX amp so it is good that way. It also did not clip then but then again didn't produce max power either. The variations become quite large at lower volume settings but I am not concerned since you have the option of lower gain settings. Then again if you have to leave it at high gain due to need to drive different headphones, then it will be a concern. I started my testing with Sennheiser HD-650. There was plenty of power here, creating sensation of physical bass at exceedingly high output level. Switching to Hifiman HE-400i, there was a lot of power here too but I could get the unit to get distorted at the extreme limit. Overally, the subjective results are excellent for everyday listening. The physical appearance of the Lake People G109-S doesn't do much for me. For all the money you are spending, you are not going to get a case that "looks pretty just sitting there." It is what I expect to see in a $150 box. The engineering and design though, appears to be excellent. I could find no fault with it. Good use of discrete output stage produces high voltage swings making the unit very good fit for high impedance headphones. Performance is still very good at low impedance but perhaps a bit worse. The G109-S unfortunately faces stiff competition against the JDS Labs Atom which would match or beat its performance at just USD $99. The feel of the volume control is better than the Atom and the metal enclosure and inclusion of power supply are small pluses. But lack of gain switch is a big turn off. For its price, the G109-S competes against Massdrop THX AAA 789 which costs nearly half as much. It has external gain switches, XLR output and much nicer looking enclosure. Alas, availability is poor as of this writing. For people in the EU who want to buy locally, the Lake People G109-S is a very nice performer and would be a good option, perhaps better than any other alternatives of the units I have tested. I will marginally recommend the Lake People G109-S considering that the value is not there. Nor the looks. Oh, I forgot to note this: even with the jumper set to grounding, touching the volume control sharply increases noise. From what I recall it reduces SINAD by 15 to 20 dB. So keep your fingers away from the knob when listening! I thought Fried of Lake People was a big proponent of balanced. Didn’t know they make unbalanced gear. In studios there are better known for their ADC, I have seen them all over Europe. They are a small company in South of Germany in Konstanz. You can go to the factory and talk to them, that was nice. THey have an audiophile brand called Violectric. They also sell a reference serie. They claim 127db SNR form this newer Model +- 530 euros. Amirm, maybe you should plot a graph of your net worth in comparison to Bezos' ex so we can keep track. I just bothered to read the donation info the other day, and I'll admit the fact that there are new quips every time is something that, as silly as it is, reminds me of the much greater time and effort involved in doing these reviews and measurements. It's a decent amp. But there are two weak points. Distortion at low impedance load 16ohm or less. Power supply noise, it's very audible with sensitive iems. Noise performance can be better but at normal listening volume isn't that audible. And its can be modded to improved by swapping some resistors and parallel a 470ohm resistor between pot's output and ground. Glad to see the first Lake people's product is reviewed by Amirm, I used to have a violectric v90 which I think it's a good amplifier for the size and 2nd hand price( ~$250). Interesting. I have been wondering a lot about the performance of this brand for the past few weeks. It's nice to see how it compares. I do like the idea of being fully discrete output stage, I like bold designs...even the non-conformist one from the Jazz headamp. Moving the transformer away from the headphones plug and audio circuitry (a bigger case will help here) or at least using a shield around the transformer will lower the mains hum with at least 10dB. This should improve the SINAD with couple of dBs for sure. 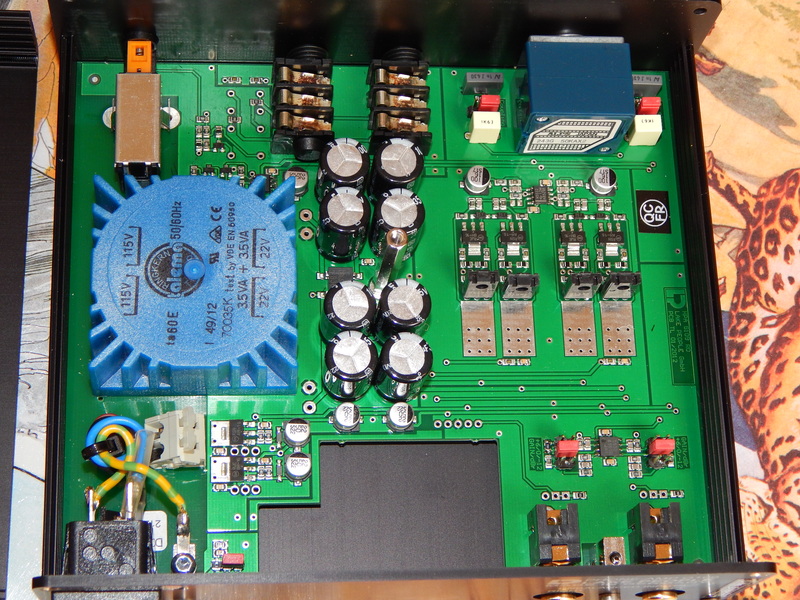 I think small-case amplifiers with built-in linear power supplies are all prone to such mains hum. Also, using non-shielded cheap SMPS will not help either, so an external PSU or a bigger case will alway help with such undesired noises. Here I wrote about mu metal and others. I know you did, but worth mentioning again. I've used GOSS in the past with good results, although Mu Metal might be better for this. Finally a Lake People Amp Review and im quite happy to see these results, cause im using a Lake People HPA RS 02 which i got off of Ebay for 280€ (like new) 2 years ago. Thanks, Amir! Been curious about how this brand measures as well. They are better known for their higher end SS amps, the Violectric V100 (used by Axel Grell while engineering the HD800), the V200, V281, etc. Something tells me overtaking the THX 789 isn't going to happen though. I own the V100, maybe I can send it in for measurements someday. I have this amp sitting in my drawer. Glad to see how it performs. I bought it to drive my Beyer T1 and HD800 a long time ago. I remember I had to open the case a few times to change the gain and fix the hum. It's the reason I looked replace this amp. Their violectric-branded amps are said to be better performing aside from better looking than their Lake-People counterparts. Needless to say, I'm curious to see measurements of one. I have their V280 which I used to drive my HE-6. Wow, had no ideas they had amps going for $5,500!! !